There’s nothing more classically American than the drive-thru. Today, these havens of greasy fries, delicious burgers, and fast service have spread throughout the globe, with an estimated half million locations worldwide! Drive-thrus are beloved for their cheap food, service that gets you in and out in record time, 24-hours access, and convenient locations near highways, making them the ideal stopping points for road trips. The rise of the drive-thru has allowed drivers around the world to turn their cars into second homes. After all, many people spend hours commuting in their cars every day, and eating meals from the drive-thru as well. Some studies estimate that the average driver will spend nearly 1800 hours of their lives eating in the car! Drive-thrus have a long history, almost as long as the automobile itself. Drive-thrus began in the United States as drive-ins in the 1920’s. Drive-ins were restaurants where drivers could park in the lot, and be greeted by “carhops” (taken from hotel bellhops). The carhops would take their orders back to the restaurant, and bring the bags of food out to the lot. Customers would then sit in their cars and eat in the restaurant parking lot. You may still see carhops today if you visit a Sonic restaurant, where they bustle around on rollerskates! From there, it was a natural evolution for restaurants to install to-go windows for drivers to order from cashiers directly, thus saving the time it took for carhops to travel from the kitchen to the parking lot. The Pig Stand restaurant in Los Angeles, California was one of the first restaurants to adopt the to-go window model in 1931, but the first true drive-thru wasn’t established until 1948. This was the first In N Out location in Baldwin Park, California. This In N Out had a brand-new intercom system (a very snazzy technology in those days) and a lack of seating both inside and out, making it a true drive-thru. Interestingly enough, the same factors that led to the rise of the drive-thru in the early 20th century are the factors that are still most important to drivers today. However, as there is now such a wide variety of drive-thrus to choose from, franchisees and store owners have to live up to very strict standards in order to ensure customer satisfaction and repeat visitors. 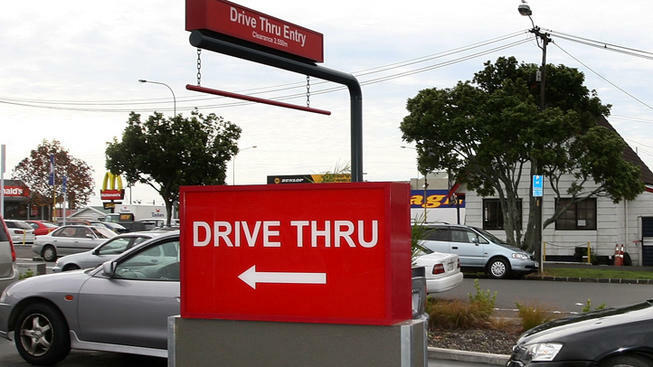 Basically, drivers want the easiest and most convenient drive-thru experience possible, and there are a variety of factors that go into achieving this. A few of the most important factors are outlined below. Drivers want large, easy-to-read menus that make ordering as simple as possible. Most menus feature the more expensive combo meals in the center (in order to entice drivers to spend more!) and cheaper, a la carte options on the sides. Drivers also value food items that are easy to eat on-the-go, orders that are delivered accurately, drive-thru lanes that are easy to access via car, and the fastest service possible. Take a look at the graphic below to learn which franchises are currently succeeding, and which need to improve. There’s also a variety of fun drive-thru facts you probably didn’t know! More information can be found here. Please include attribution to CarRentals.com with this graphic. Salman Zafar is an ecopreneur, consultant, advisor, speaker and journalist with expertise in waste management, waste-to-energy, renewable energy, environment protection, conservation and sustainable development. His geographical areas of focus include Asia, Middle East, Africa and Europe. Salman is the Founder of EcoMENA, a popular voluntary organization based in Qatar. He is also the Founder and CEO of BioEnergy Consult, a reputed consulting firm active in biomass, waste-to-energy and waste management segments. Salman is a professional environmental writer with more than 350 popular articles to his credit. He is proactively engaged in creating mass environmental awareness in different parts of the world.